Hi! 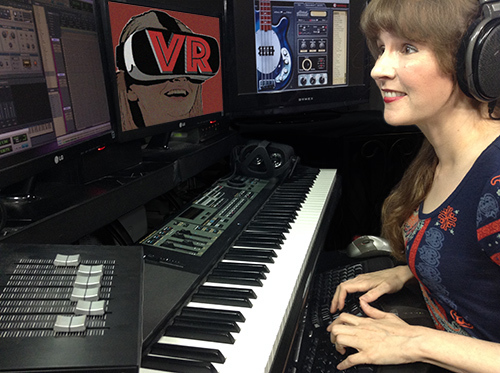 I'm videogame composer Winifred Phillips, and today let's spend a little time discussing the allure of composing music for virtual reality. There are a lot of reasons why we video game composers might be excited about creating music for VR games. The technology of immersive virtual experiences has the potential to offer an intensity of emotional involvement transcending most other forms of entertainment. What game music composer wouldn't be inspired by that? However, it's tough to be inspired by something we may not have experienced yet. Becoming a VR gamer can be a fantastic rush, but the financial barriers to entry can be pretty high. The top VR headsets and gear require a VR-ready computer, and purchasing the computer and the VR hardware together can easily exceed two thousand dollars. While there are lower-cost VR options (such as headsets designed to work with mobile phones), the virtual experience provided by these economical VR systems can offer only a fraction of the spectacle delivered by the high-end models. If we want to take our first steps into a dazzling virtual world, but we don't have a bucket of cash on hand, what do we do? There are hundreds of VR arcades in America and around the world, so all it takes is a quick search on Google Maps to find one near you (or you can just click this link and the search results will pop up right away). Below, I've included information about four companies with multiple locations and big ambitions in the VR arcade business. Some of us may be familiar with Survios as the game developer responsible for such VR hits as Raw Data, Sprint Vector, and Electronauts. 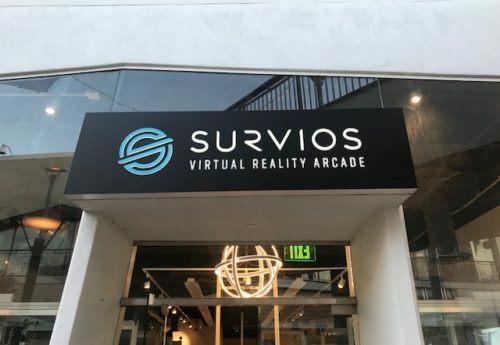 Formed by graduates of University of Southern California's Mixed Reality Lab, Survios is backed by $50 million dollars worth of venture capital from investors that include Lux Capital and Metro-Goldwin-Mayer Studios. The VOID is an acronym for "The Vision Of Infinite Dimensions," and if that sounds pretty fanciful, there's a good reason for that. It was originally meant to be one of the marquee attractions of a planned fantasy-themed amusement park in Pleasant Grove, Utah. When the building of the theme park hit a snag in 2015, the creators of the park decided to spin their Vision Of Infinite Dimensions into a stand-alone franchise of VR installations, giving birth to The VOID VR Arcades. What differentiates The VOID from other VR arcades is its combination of virtual and mixed reality elements. While VR gamers in The VOID don the usual headsets that immerse them in a digital world, their movements aren't restricted to a small, well defined play-space. Instead, they can walk down any in-game path they see, and reach out with their hands to touch their surroundings. This is because many of the physical features and objects within the game's virtual world are constructed in the real world. When players reach out to open a virtual door, their hands encounter an actual door that responds to their touch. These physical features are coupled with special vests providing haptic feedback: vibrations corresponding to any prevailing forces that might impact the player, such as a digital character placing his hand on the player's shoulder, or a shockwave emanating from a nearby explosion. Atmospheric conditions are also emulated, including wind gusts and temperature changes. When players can explore a virtual world using all of their senses, the feeling of immersion becomes intense. We're all probably familiar with IMAX as the company responsible for bringing us a movie format capable of projecting at a very high resolution onto gigantic screens in specially-designed theaters that move the audience as close to the on-screen action as possible. Since IMAX's focus has always been filmmaking, when they began experimenting with incorporating VR into their business, they approached it from a filmmaker's point of view. In November of 2016, the company secured $50 million dollars of venture capital so that they could finance 25 exclusive VR "experiences" that would only be available through IMAX. Their plans are to roll out these projects over the next 3 years. The projects will feature prominent filmmakers such as Justin Lin (Fast & Furious 6, Star Trek Beyond) and The Russo brothers (Avengers: Infinity War, Captain America: Civil War). They've also partnered with Warner Bros. to co-finance and produce 3 VR projects based on Warner Bros. tentpole franchises. Finally, IMAX has always been a film technology company, so their VR efforts also include the development of a new "cinema-grade VR camera" for their virtual reality projects. Partnering with Google has enabled IMAX to develop this new VR camera technology, which is expected to launch in 2018. All of these efforts have informed the approach IMAX is taking in bringing VR to its IMAX theater audiences. In February 2017, IMAX launched its first dedicated "IMAX VR Center," located right across the street from the massively popular shopping complex The Grove. In the first three months, the location saw 20,000 unique visitors and great revenues. Buoyed up by this early success, IMAX launched five additional VR centers - two in New York, and three additional locations in Toronto, Manchester and Shanghai. 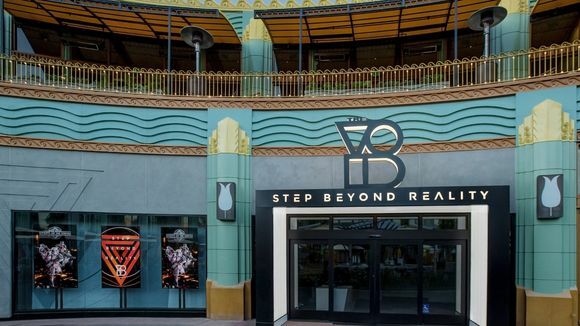 While none of the other VR centers have performed as well as the Los Angeles flagship location, this hasn't dimmed IMAX's enthusiasm for the future of VR. The IMAX VR centers feature HTC Vive and StarVR headsets, with haptic feedback vests to make each VR adventure feel more real. IMAX is even experimenting with adding smell to their VR offerings in order to deepen immersion. Also, like the Tesseract model employed by the Survios VR arcade, the IMAX VR centers allow players to enjoy their virtual adventures while their companions watch. This is achieved, not by a Tesseract-style glass enclosure, but by virtue of the low walls surrounding each VR play-space. Now lets move away from the full-scale VR arcades, installations and centers we've been discussing up to this point, and take a look at a virtual reality attraction designed to fit into the business models of existing entertainment facilities. Hologate isn't meant to occupy its own retail space in a shopping center or a mall, and it's not a system that needs its own building to house its technology. Instead, Hologate shares more in common with an old-school multiplayer deluxe arcade cabinet. It's a "pop-up" VR platform that can be plugged into any existing entertainment attraction, from indoor amusement parks and cruise ships, to bowling alleys, trampoline parks, and "entertainment restaurants" such as Dave & Buster's and Chuck E. Cheese's. While these types of surroundings may be less than futuristic or glamorous, Hologate nevertheless manages to deliver a full-fledged VR experience for four simultaneous players while occupying only 300 square feet of space. The Hologate system was created by German CG artist and game developer Leif Arne Petersen. Having founded the IGNYTE VFX studio in 2008, Petersen's work previously concentrated on computer animation for advertising and film/TV. Eventually, the company moved into virtual reality development, culminating in the spring of 2017 with a high-profile contract for the German car company Audi to create a VR tribute to the pitstop process during the famous Le Mans sports car race in France. However, while the Le Mans VR Experience was attracting a lot of attention, the IGNYTE studio was also busily working on something very different from their previous projects. Their new venture would be a physical VR platform that could be bought and easily assembled by existing Family Entertainment Centers (FECs) around the world, making virtual reality both financially accessible and conveniently local for consumers. VR is a promising new medium, offering great opportunities for artistic expression for video game composers. 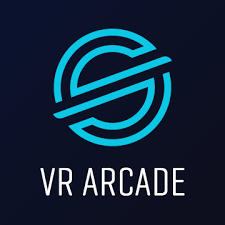 If you haven't had a chance to try VR yet, and you don't want to make a hefty purchase to obtain a high-end VR system, you can check here to find your local VR arcade and give virtual reality a try. Lots of ambitious development teams are entering the world of VR, and certainly we'd be remiss if we didn't consider VR as a possible avenue for our work as game music composers! I hope you've enjoyed this article, and please let me know your thoughts in the comments section below!